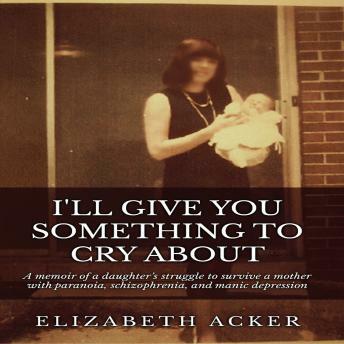 In I'll Give You Something to Cry About, Elizabeth Acker gives a stunning account of growing up under the abusive control of an emotionally and mentally ill mother. Elizabeth is forced to become estranged from her father and struggles alone to create hope and meaning for her life while serving her mother like a slave. This book is a true account of a daughter's struggle to survive a mother with paranoia, schizophrenia, and manic depression.